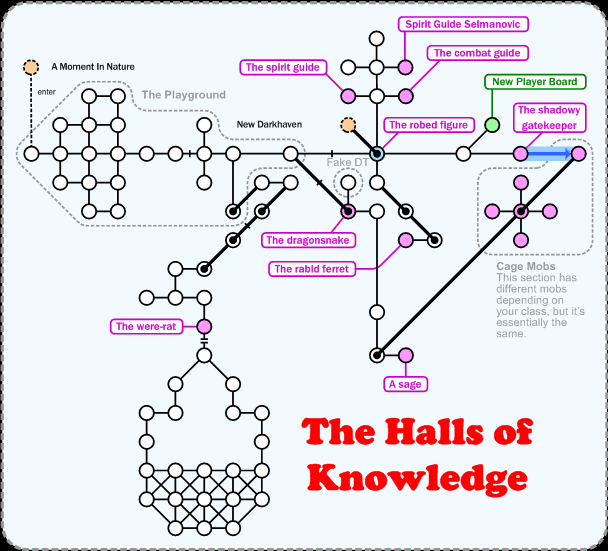 The Halls of Knowledge (formerly known as the Darkhaven Academy, and sometimes still referred to as such). This is where you start the game, and if you're level 2 or 3, this is where you should be. Basic equipment, decent leveling and comparable safety. Note that only players of level 20 and below may enter the playground and the cage mobs sections, and you can't be uplifted in this area. If you need help, you will have to turn to someone within these levels or a member of the Newbie Council. Walk ( 3e, s, d ) to get from DH to the room marked in blue.